Virtual server is a MSPControl logical unit, a way to combine different services from several physical/virtual servers and build a new full-fledged server that can be used as a target server for hosting plans. MSPC Virtual server is not related to any virtualization technology, it is just a logical entity in MSPC. To view the list of Virtual Servers click Settings > Virtual Servers page on the top menu. Specify the display name of the virtual server and optionally description. This description can be viewed then on other pages in server details pop-up. 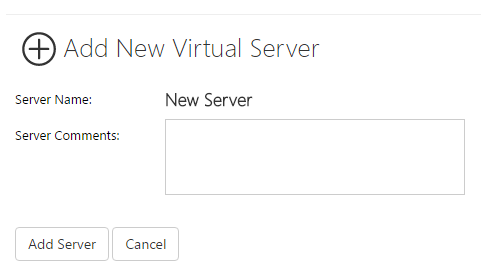 Click Add Server button to add a new virtual server. "Virtual Server Details" screen will appear. In order to add services to this virtual server click Add Services button. System will show all servers registered in control panel with services that were set up on the servers (to set up services, refer to this article). Select services you would like to include in the current virtual server and click "Add Selected" button to add them and return to properties screen. Instant aliases allow your customers to work with their sites prior to DNS distribution. This is archived by creating for any created DNS zone a second DNS zone with the name mydomain.com.providerdomain.com where mydomain.com - customer domain and providerdomain.com - host (administrator or reseller) domain name with already propagated DNS zone and pointing to the current server. Instant aliases can be defined on server (either physical or virtual) and hosting space levels.